I will fly with Cebu Pacific Airlines for about 88 US round trip from Manila to the city of General Santos in southern Philippines on Sunday. I like to learn about Ethnic groups and how language evolves, I am presently in the Tagalog language area of the Philippines. 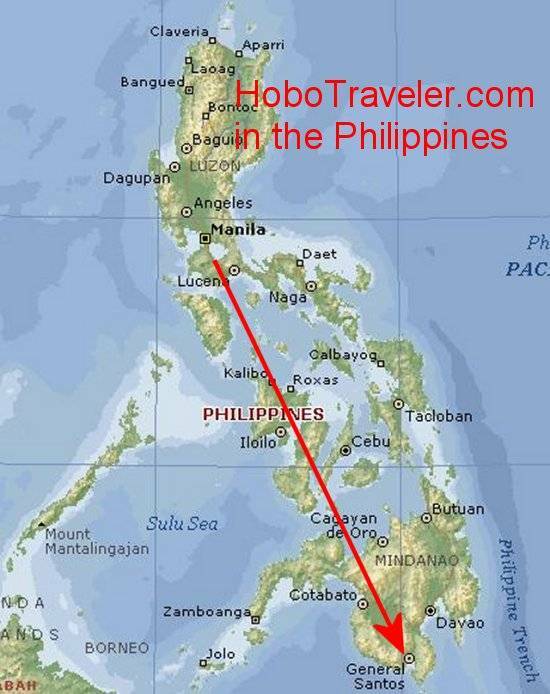 The island of Mindanao or maybe province is one location with Ferdinand Magellen on his around the world trip stopped. I am presuming there is a bigger Spanish influence in this area, and hope to find different Ethnic groups than Manila. There is hopefully a combination of cultures here, older in nature, less modern, and helpful in my understanding of the evolution of the Philippines nation. I am going to General Santos, avoiding in a way Davao, the normal destination, and trying to find culture that has not dramatically changed by the influence of the western world. I am not trying to stay away from modern, I am trying to stay away from a tourist culture, whereby it is a man with a girl in tow. I believe the Philippines, a mystery to me, has some tourism gold to discover, however like any other gold, it comes with a price. There is this tourist bubble overlaid on Manila, not informative, actually stops people from learning about the good of the Philippines and makes it easy to find the seedy parts of the Philippines. This is one of my first big jumps, I hope outside the tourist bubble. I will probably go along the coast south of General Santos and see what I find. I purchased a map, but it is not very good, only shows the main road, not the small of the small roads from General Santos to the coast. They country is very proud of this man. I am not going there to learn about him, something to do with a look on faces of Mindanao native, is it Indonesia, Chinese, combination of Spanish and other, what is the roots of the language there. Plus what is happening in this area with the Islamic culture, is it soft, moderate, or hard line? Many interesting aspects to the ethnic groups of the Philippines, and maybe a great place to travel by sailboat.